A lot of Syracuse people. 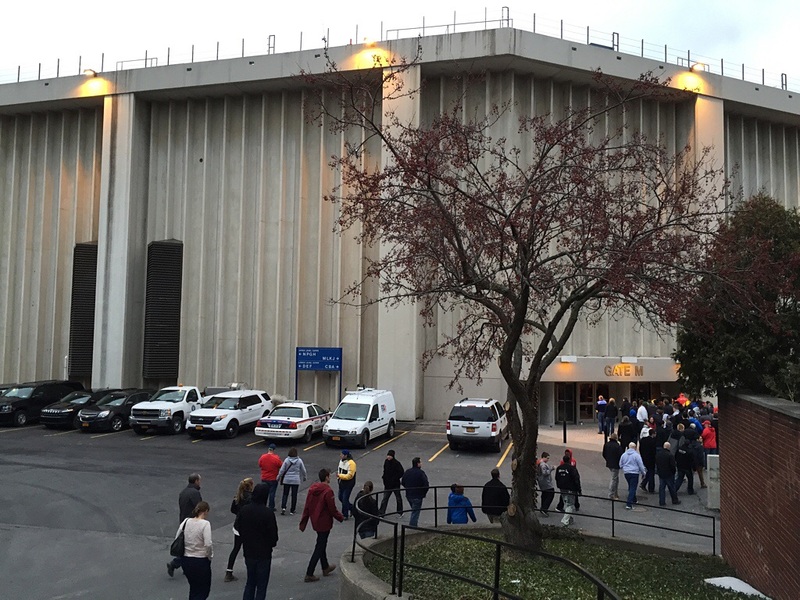 I was right in my prediction Thursday when I declared that the Sheraton University would not be empty in the Friday hours before the East Region of the NCAA Tournament Sweet Sixteen up the hill a short stretch in the Carrier Dome. Interestingly enough, as my dear wife Karen and I made our way to a table we shared with an old media acquaintance of mine Dollar Bill and his very nice cohorts, we discovered that except for a few folks wearing North Carolina State shirts, everybody in the joint prefered the Orange of Syracuse or neutral wear. 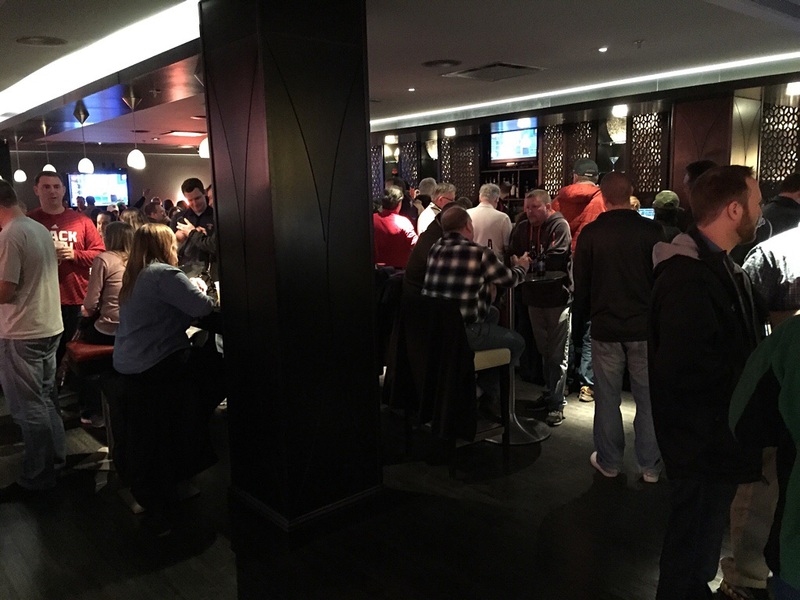 Karen and I sussed out that the four Louisville, Michigan State, Oklahoma and indeed, the Wolfpack, too, all had “official” hotels other than this, so maybe their fans had adopted their tap rooms for pregame libation. Or maybe this place was just so very well known for its Orange basketball and football soirees. In any case, we’d see and hear plenty from the four squads represented in the Dome. That’s what I wrote about for my Mark It Up in Syracuse community blog column for Syracuse Public Media site waer.org. You can read it and see my photos by clicking the link below. 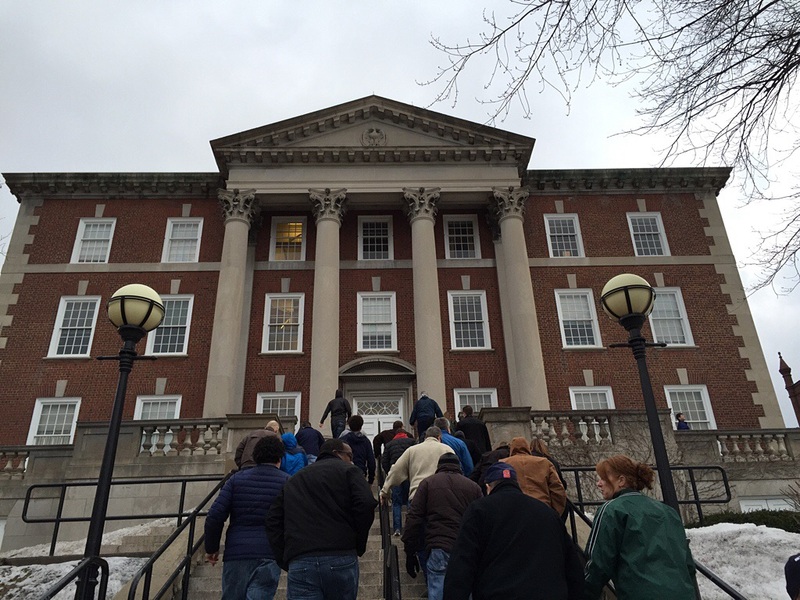 Up the hill toward the Carrier Dome. 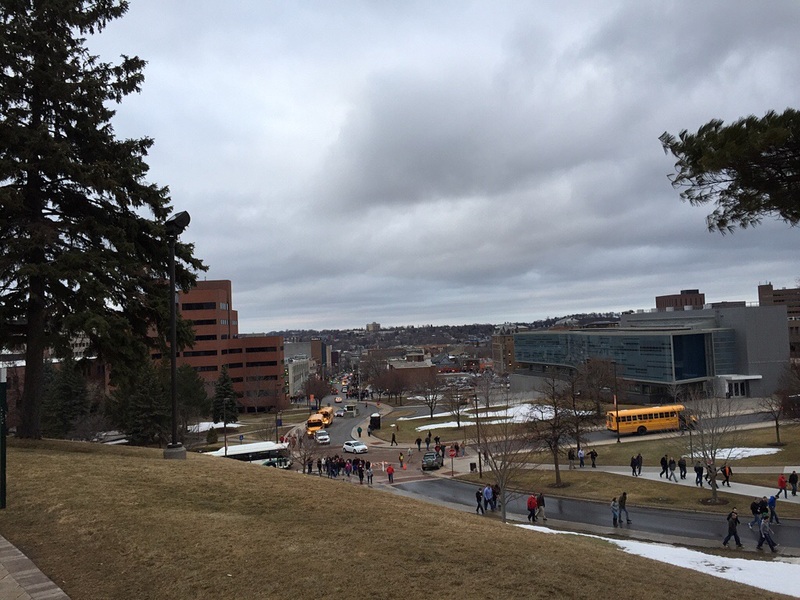 It was a cold walk up the hill toward the Carrier Dome. It was an amazing view when we reached the plateau and I took a moment to look back to view from whence we had come. Steady stream of basketball fans. The Dome was ready with its wand-holding security guards at the entrances. We have the routine down by now. I must empty my pockets of everything. This time my two hands held my iPhone 6, a reporter’s notebook, two pens, my keys, folded paper money, and coins. Karen has to hold open her purse. Then we get the magic wand to not beep. I do not mind the security measure. I was quite happy with the seats Karen has scored at work, for a very good price. They were high up, second row from the top, court side. The view was good, and next to us was a former colleague and his wife. They’d attended Michigan State. That made it a lot more fun. Of course, that was without any iPhone 6 close-up help. 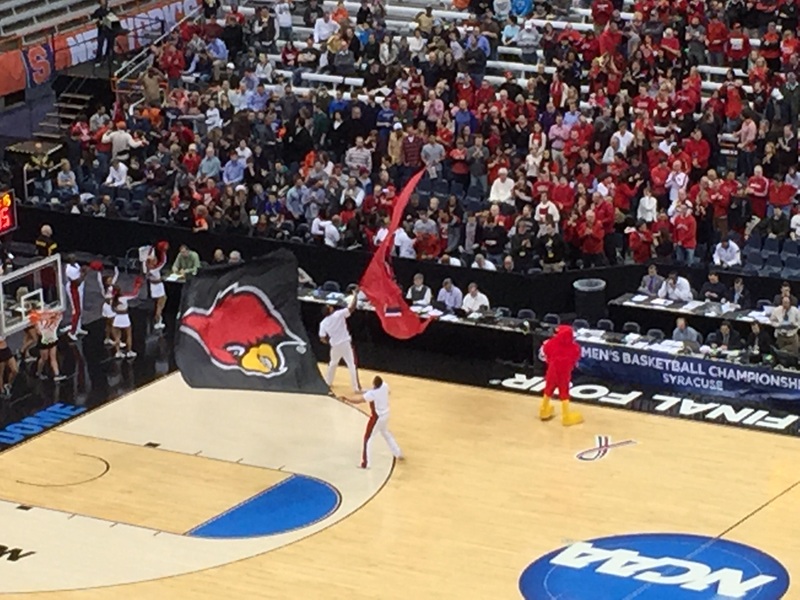 Here’s the Louisville Cardinal with that feature on full. Our eyes are even better. Would you have been surprised to find few followers of the other three teams at the nearest convenient tap room, and what’s your theory behind that? Would you mind getting wanded at the entrance? What do you think of the view from the seats? How do you prep for a Sweet Sixteen? To have been there, in the midst of the excitement, Mark- that is so extremely cool! I would just love the energy and enjoy the view! Wow! I am thankful for being wanded, since this is security and peace of mind that others also are enduring this process. Loved this post, Mark. Thank goodness for Karen ‘snagging’ tickets at an awesome price and you both getting to enjoy them! Thanks, Robin, for enjoying the trip with us. Yes, wanding is needed, unfortunately, to enjoy the fun these days. Exciting. 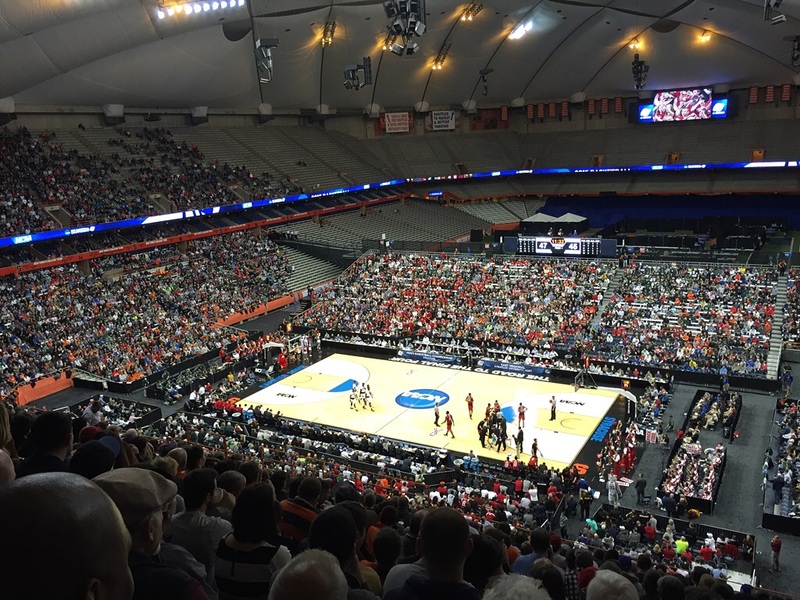 My alma mater is playing in the Dll Championship today and I’m really bummed we couldn’t get there–I hope the contingent who made the trip was hosted as graciously as Syracuse hosted their guests. I hope your alma mater both has a great time and comes away victorious today, Chuck. I hope you can watch on TV and enjoy the moment that way! I love that your column is called Mark it Up – clever! As you know, I’m sports stupid Mark, but when I saw Louisville in the title it reminded me of an experience that is kinda sports related. I was there a couple of times and they have this annual ‘ride your bike naked through the city’ event. p.s. You may want to check out the bike ride and write about it -take Jim with you! Radio DJ name, Rachel. I’m pretty sure he’s really Bill, though. 🙂 Yes, that sky is something, isn’t it? I’m happy that Louisville (one syllable) came thru on this one bro Mark. I’m also happy they are in a different league, so I can be happy they won. I’m happy I know what I just said. Golly, I’m just happy today, bro. I’m also wondering something. Why is your background color red instead of Syracuse Orange? Red is okay, but orange rocks. And KY blue rocks even more. Bet you saw that one coming, right? I gotta get back to messing my own site up now. Have a good one. One syllable, and your son’s squad has a big game tonight, sis Angie! I don’t suppose the former colleague’s initials are GC and he just changed his FB picture to Sparty? That second pic makes me feel like I’m going to topple over backwards. The stairs are pretty steep, Kerbey, but at least there’s not that many of them! Can’t type. I have vertigo now. Of all the live sporting games I’ve been to it is basketball that gets me fired up. I love the fast pace. Plus, after a long football season, it sure is nice not to have to scream “kill them” at the defensive line. Wink wink…I have a problem with doing that, you know. I just get into the game a little too much. Wish I could have been there with you – more so now that I know how it turned out. Thanks. And I’m still catching my breath.